12.5" RCOS @ ~f/9 (2880 mm fl) 0.64 & 1.28 arcsec / pixel. The Zoomify image scale is 1.28 to 3.07 arcsec / pixel. Two images were created... a standard RGB, and a synthetic color image with Ha:OIII:OIII mapped to R, G & B respectively. With PhotoShop, the synthetic image was added to the RGB, using the lighten blend mode, at 30%. Click here for the color mapped narrow band images. CCDSoft, CCDStack, Photoshop CS3 & Noel Carboni's actions. eXcalibrator for (b-v), (v-r) color calibration, using 41 stars from the NOMAD1 database. CCDStack to calibrate, register, normalize, data reject, combine the sub exposures and RGB color combine. PhotoShop for color combine & on-linear stretching. 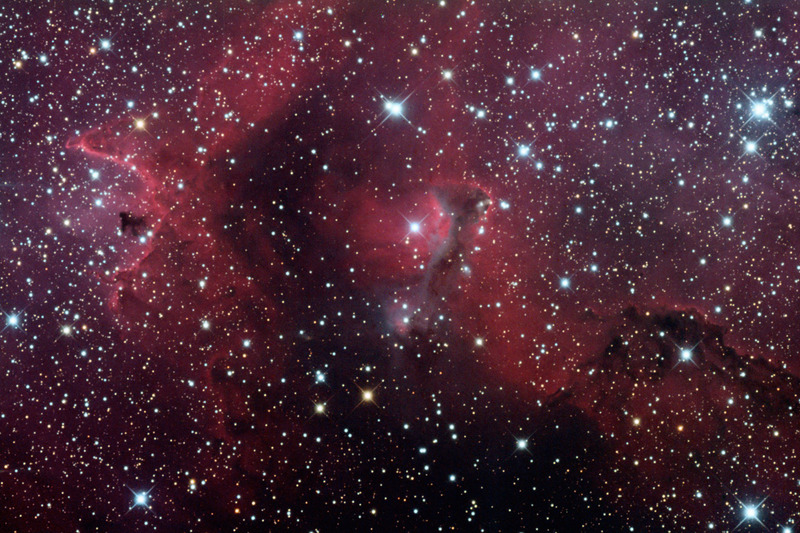 This is a close up view of an interesting region in IC1848, the Soul Nebula. IC1848 (Sharpless 2-199, LBN 667) is locate in the constellation Cassiopeia, at a distance of about 7000 light-years. The central formation is reminiscent of Thor's Hammer in Bryce Canyon, Utah.